SEDL helps engage families and communities to improve student and school success. We do this work at every level of the education system. For instance, we assist the Parental Information and Resource Centers (PIRCs) through our National PIRC Coordination Center. When educators, families, and communities work together as partners, students and schools benefit. Student learning increases and dropout rates fall. School climates are healthier and safer. And school performance improves. The PIRCs provide a vital infrastructure for engaging parents and families in children’s schooling. SEDL’s National PIRC Coordination Center, in turn, provides technical assistance to help the PIRCs collaborate, build staff knowledge, and improve services. We operate the center in partnership with the Harvard Family Research Project and the Miko Group, Inc. 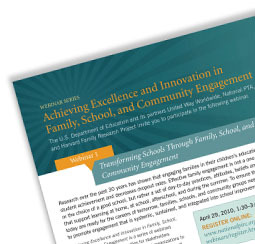 In 2010, the Coordination Center’s work focused on supporting the U.S. Department of Education (DOE) in reframing family engagement policy and practice. The goal is to move educators away from random activities to engagement that is tied directly to school improvement and classroom learning. Two ways we helped steer this shift were a national policy forum and a new webinar series. The policy forum, which we helped the DOE host, advocated family engagement as a key school reform strategy. Research shows the value of engaging families as a force for improving schools, but the approach is still seen as unconventional. The forum brought together experts and policymakers to inform new directions in policy. Such changes better enable parents and community groups to partner with schools and provide valuable support. The new webinar series is showcasing research, best practices, and innovations from the field. The DOE is leading the series in partnership with SEDL, the Harvard Family Research Project, National PTA, and United Way Worldwide. Webinar topics in 2010 include effective training and making data accessible and useful to families. For each webinar, leading practitioners are sharing how they are empowering families to participate actively in their children’s learning. Through this series, school, district, and state educators and practitioners are broadening and deepening their knowledge. For more information, please contact Lacy Wood, SEDL project director at 512-391-6567 or via email at lacy.wood@sedl.org.